The first time it was reported that our friends were being butchered there was a cry of horror. Then a hundred were butchered. But when a thousand were butchered and there was no end to the butchery, a blanket of silence spread. Bertolt Brecht,2 "When Evil-Doing Comes Like Falling Rain"
Genocide is an extreme form of human beings harming other, innocent human beings on the basis of blanket accusations of collective wrongdoing. It is the most blatant, extreme violation of basic human rights. Although mass killings have taken place throughout human history, some argue that the past century witnessed far more genocides than any other century that preceded it. For this reason, the twentieth century has been referred to as "the century of genocide," "the century of evil," and "the century of violence." The twentieth century also witnessed the Holocaust: the most severe blow to human rights, the most extreme display of indifference to human suffering, and perhaps the greatest moral breakdown ever known to humanity. However, despite the prevalence of genocide in recent generations, people tend to pay insufficient attention to the phenomenon. Academic syllabi on various levels, including the university level, pay little or no attention to the subject, even though knowledge and awareness of the phenomenon are necessary conditions (albeit not sufficient on their own) for preventing societies from carrying out genocides, aiding perpetrators of genocide, or standing idly by, without taking action to stop them. The Holocaust is currently the most extreme instance of genocide known to humans, and for more than a quarter of a century debates have raged regarding the degree to which the Holocaust can or cannot be compared to genocides that have befallen other peoples. After all, the Holocaust was unique in assuming the form of a modern and efficient &apos;industry of death,&apos; based squarely on a racist theory and ideology that sought to exterminate all members of the Jewish people, regardless of their country of residence. For this reason, the Holocaust has taken root as a central aspect of Jewish historical consciousness. Nonetheless, it is important to bear in mind that a large number of genocides against other groups were perpetrated during the twentieth century, and that genocide will most likely to continue to be perpetrated in the future. The denial of, indifference toward, and disregard for genocide of any people is something to be abhorred. Beyond our moral obligation to recognize these acts, however, we also need to remember that the failure to acknowledge crimes against others typically emerges as a crucial and often preeminent aspect of the personal consciousness and worldview of the victims. In some cases, the lack of recognition also has a decisive impact on victims&apos; efforts to cope with the tragedy and to rehabilitate themselves, which is a process that may continue for long periods of time and, in some cases, indefinitely. In December 1995, fifty years after the .end of World War II, I sat in the very courtroom where the Nuremberg trial was held. I was part of a BBC TV panel discussion on the legacy of Nuremberg. Afterward I visited the site of the former Nazi concentration camp at Dachau. The Germans seemed determined to ensure that their nation would never forget the atrocities that had been committed for the sake of Hitler&apos;s obsession with Aryanism. In Dachau there was a museum above whose entrance the haunting words by George Santayana were inscribed: "Those who forget the past are doomed to repeat it." The compelling reason why we should learn about the Holocaust, and the genocides committed against other peoples as well, is so that we might be filled with a revulsion at what took place and thus be inspired, indeed galvanized, to commit ourselves to ensure that such atrocities should never happen again. It is sadly true what a cynic has said, that we learn from history that we do not learn from history. And yet it is possible that if the world had been conscious of the genocide that was committed by the Ottoman Turks against the Armenians, the first genocide of the twentieth century, then perhaps humanity might have been more alert to the warning signs that were being given before Hitler&apos;s madness was unleashed on an unbelieving world. For there are telltale signs, which those with eyes to see can discern, that should make us more vigilant. When tyrants feel insecure and under threat and personal liberties are eroded, then our antennae should be particularly sensitive. In times of rapid change and flux or when there is turmoil and social and economic upheaval and political unrest, then those in power will usually be on the lookout for scapegoats to take the blame for why things are going awry. The world might have been a little more vigilant when such symptoms began appearing in 1930s&apos; Germany. We want to learn about the Holocaust and other instances of genocide because we have so frequently been dazzled by the remarkable technological strides that humankind has made — space travel, landing on the moon, lightning-quick communication — that these achievements have made us not just properly proud but overweaning in a presumptuous arrogance that has believed in automatic progress. The sobering fact is that our technological achievements have not been matched by an equal moral advance. We are wonderfully intelligent but dwarfish in moral stature. We spend obscene amounts on budgets of death and destruction when a minute fraction of these huge defense budgets would ensure that God&apos;s children everywhere would have enough to eat, access to clean water, adequate health care, and a good education in a safe environment. We have the capacity to feed the entire world population many times over, but children die of starvation and easily preventable deficiency diseases whilst we dump excess food to maintain food prices. The instances of genocide and the occurrence of the Holocaust are stark reminders that we have an extraordinary capacity for evil. Particularly devastating is the realization that some of the most awful instances were committed not by illiterate, barbaric savages but by some of the most sophisticated, the most learned, those who claimed to be Christian. It would give us reason to pause as — we thought to preen ourselves — that these things were done by what appeared to be normal, ordinary human beings, the ultimate proof of the banality of evil. But we have had wonderful accounts too in nearly all these instances of evil of the capacity of people for good — extraordinary examples of bravery, magnanimity, goodness. We learn too that we do have remarkable capacity for good, which we should harness to make this a better world. It should all awaken in us the desire to value human life as precious, all human life, so that we would refuse to demonize even adversaries. What makes genocide possible is that the victims are seen as less than human. In Africa we have something called ubuntu, the essence of being human, when we recognize that our humanity is bound up in that of others. We say a person is a person through other persons. We are created for dependence, togetherness, and complementarity. Genocide happens because people are intolerant of difference. Ubuntu celebrates diversity. Our differences should make us realize our need of one another. The completely self-sufficient person is subhuman. Ubuntu speaks about hospitality, generosity, caring, and compassion. It is important to note a very important lesson — that ultimately those who are responsible for such atrocities come a cropper. This is, in fact, a moral universe; right and wrong matter; and evil, however rampant and apparently unstoppable, does not have the last word. In the end, good does prevail. Where are Hitler, Amin, Bokassa, Pinochet, Pol Pot, et al.? The world deprecates them. Those whom the world honors are in the end good people. Good matters; right matters. They have the last word. We learn about the Holocaust and other genocides so that we can be more human, more gentle, more caring, more compassionate, valuing every person as being of infinite worth, so precious that we know that such atrocities will never happen again, and that the world will be a more humane place that is hostile to such horrendous occurrences. Desmond Tutu stresses memory and historical consciousness as means of preventing the recurrence of genocide. Does the naïve belief that human beings are incapable of such intense evil actually help to facilitate genocide? Does the inactivity of bystanders (people who are neither victims nor perpetrators) stem from the same belief? Might a greater awareness of the genocides of the past help debunk such beliefs? For many, many years, it has been my opinion that in a humane, in a political, and in an educational sense, we Jews failed to stress the point that we were persecuted and suffered in concentration camps, together with people from 18 other nations, during the Nazi reign. Right after the war, I dreamed about the formation of a brotherhood of victims that could also be a fighting body against any new-or old-forms of National Socialism. After all, this was the first time in our common 2,000-year-old history of living together that we had had the same enemy. But we were not able to make use of the opportunity, just as there are whole nations that have chapters in their history called "missed chances." In the 1950s I appealed to all to not always talk just about the six million Jews who had been murdered and ignore the others; this reduced National Socialism to an exclusively Jewish problem. No one was prepared to listen to me. When I agreed to give my name to a center that was about to be built in Los Angeles in 1977, my one condition was that it would be dedicated to the six million Jews and the millions of others who had suffered with us. You can imagine how all at once a chorus of hateful people accused me of wanting to reduce the meaning of the Holocaust. My explanation that this expanded emphasis only increased the Nazis&apos; guilt was not accepted. I proved to these critics that there are more non-Jewish survivors of concentration camps living in the United State than those of Jewish descent, and in order to fight anti-Semitism and Nazi and racist tendencies in the United States, we need the help of the others. Simon Wiesenthal explains why it is important to expand the memory of the Holocaust to encompass all known genocides as a means of forging a sense of solidarity among victims. Might knowledge of a multiplicity of genocides help people realize that, at any time, they too could potentially find themselves in the position of victim, perpetrator, or bystander? This is the first of an eight-book series on genocide which, as far as we know, is the first of its kind. It is my distinct hope that this book, like the other titles in the series, will also make a modest but significant contribution to increasing public awareness of the phenomenon of genocide in Israel and around the world. This book begins with an exploration of the term &apos;genocide&apos;, the circumstances in which genocides take place, the difficulties surrounding the definition of the term, and a number of other related definitions and typologies. It then examines the relationship between the terms &apos;genocide&apos; and &apos;Holocaust&apos;, as well as the distinctions between them and between the concepts of genocide and &apos;democide&apos;. After this theoretical discussion, we shift our focus to the legal realm and explore the United Nations Convention on the Prevention and Punishment of the Crime of Genocide (1948), the circumstances in which the convention was formulated, and the debates it has sparked. In the Israeli context, we consider the Crime of Genocide (Prevention and Punishment) Law and the Nazis and Nazi collaborators (Punishment) Law, which were enacted by the Knesset in 1950. The book also offers succinct definitions of a number of concepts from the social sciences in an effort to provide a better understanding of the socio-cultural phenomena that make genocides more likely — such as racism, discrimination, prejudice, and oppressions of minorities — and discusses a variety of crimes which, according to their definitions, are often related to, but are not synonymous with genocide, such as mass murder, massacre, pogrom, ethnic cleansing, and more. The series applies an interdisciplinary approach to genocide that is based on recognition of the fact that genocides are historical actions carried out by human beings, and that as such, they must be understood in their appropriate political, social, and cultural contexts. To this end, the series strives to assess the significance of genocide through academic research using tools and methods from various fields of study, including history, sociology, political science, international relations, communications, and psychology. The series on genocide consists of eight volumes, each of which can stand alone in its own right but is also part of a larger whole. In order to provide readers with the necessary context and background, each book in the series that focuses on a specific case of genocide begins with a brief introduction reviewing critical terms and concepts relevant to genocide and providing readers with a common language. The books in the series address topics including: genocides perpetrated by colonial regimes; the extermination of the indigenous population of North and South America; the Armenian genocide; the genocide in Rwanda; "homo-genocider" — the psychological composition of genocide perpetrators; the Righteous Among the Nations, who helped to save the lives of potential victims during genocides, and the possibility of genocide prevention. The series consists of two types of books: books that address general issues related to genocide, and books that explore specific genocides that have been perpetrated throughout history. Each book aims to present the socio-historical context (as conceived broadly in the social sciences) in which the genocide took place; to explore the events and the parties involved; to understand the actual and fabricated reasons for the acts and their outcome; and to analyze their significance and implications for individuals and society as a whole. While Holocaust education has already secured a place within academic and educational frameworks in countries around the world, the broader field of genocide studies, which is immensely important in its own right, is still in the first stages of development. Without a doubt, the knowledge possessed by people in most countries about other cases of genocide that took place during the twentieth century typically pales in comparison with what they know about the Holocaust. Some go as far as to argue that most genocides committed during the past century (except for the Holocaust) can be thought of as "forgotten" or "unknown," similar to those that took place in the more distance past. That being said, we must also acknowledge that the past two to three decades have witnessed a marked increase in general awareness regarding instances of genocide that took place in many countries around the world, and that a degree of concurrent (albeit, extremely limited) progress has also been made in the field of genocide education (except in the distinct field of Holocaust education, where great progress has been made). Careful observation of the development of genocide education around the world shows that progress is often driven by the initiatives and campaigns of fighters for the cause, passionate and dedicated activists who make it their life work and simply refuse to let the subject lie. Not surprisingly, many of these efforts are led by Jews interested in developing the field of genocide education, in addition to the field of Holocaust education, out of a unique sense of empathy with the suffering of other peoples. Such activists believe that, in addition to the contribution they make to the study of genocide in general, comparative studies (or &apos;genocide studies&apos;) also stand to contribute to the study of the Holocaust in various ways that Holocaust studies alone simply cannot. We too espouse this belief. Others, however, reject this comparative approach and instead emphasize the uniqueness of the Holocaust. For more than thirty years, Israelis and people around the world have been engaged in bitter debates over genocides that befell other peoples. At the center of these debates lies the controversial assertion that the Holocaust was a completely unique event, despite the fact that the Holocaust&apos;s special importance for Jews is actually unrelated to its uniqueness. That is not to say that the Holocaust was not unique among genocides-indeed, the Holocaust was an &apos;industry of death&apos; based on a racist theory and ideology aimed at exterminating all members of the Jewish people, wherever they lived. However, its major significance lies in its deep entrenchment in Jewish historical consciousness, where it continues to play a decisive role. Ironically, indifference toward and denial of the genocides that befell others runs deep within Israeli culture. Primo Levi&apos;s book The Drowned and the Saved recounts how S.S. soldiers used to amuse themselves by cynically assuring prisoners that even if some of them survived the Nazi camps, no one would ever believe their stories about what went on inside. Levi also provides an account of a recurring nightmare from which almost all survivors suffered in the camps. We should be asking ourselves difficult questions. How do we respond to other victims&apos; just demand that their murderers and the offspring of their murderers acknowledge their crimes? What role can we play in helping them achieve this goal? How do we relate to their demand that the world recognize the dual injustice they suffered — the genocide itself, and others&apos; disregard for it after the fact? One aim of the series on genocide of which this book is a part is to increase the sensitivity of students, scholars, and other readers to the phenomenon of genocide. Another is to encourage them to question their own opinions and their sense of responsibility regarding such acts of injustice and to consider possible ways of taking action to prevent them, whether as individuals or in conjunction with other members of their own social reference groups. Again, the fundamental principle underlying this book series is the universal value of human life, wherever it may be found. because I wasn&apos;t a Jew. 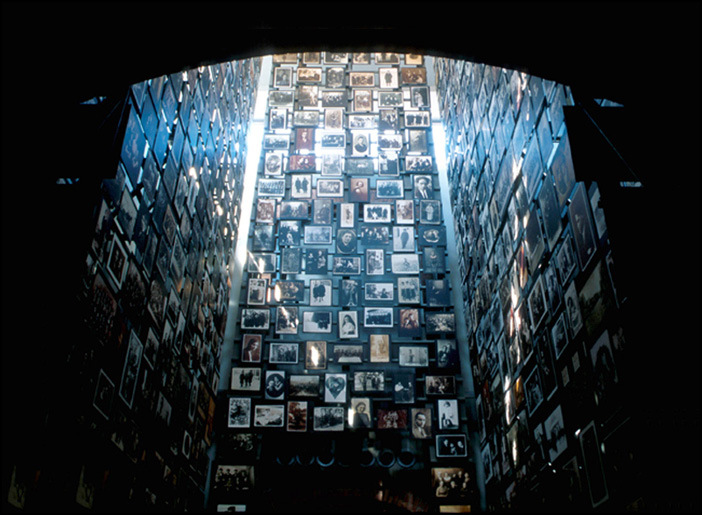 A mosaic of photographs of Holocaust victims, the US Holocaust Memorial Museum, Washington, DC. 1	Excerpt from Bertolt Brecht&apos;s poem "When Evil-Doing Comes like Falling Rain." Bertolt Brecht, Poems, 1913-1956, trans. John Willett (New York: Eyre Methuen Ltd., 1976), p. 247. 2	Bertolt Brecht (1898-1956) was a German playwright, poet, and theatre director. After the Nazis rose to power in Germany, Brecht was forced to leave his country in exile, first to Denmark and Finland, then to the United States and Switzerland, and finally to Communist East Germany. The poem "When Evil-Doing Comes like Falling Rain" was written in 1935, before the mass killings perpetrated by the Nazi regime. In this way, it can be seen as a foreboding prophecy of the terrifying events to come. 3	Desmond Tutu was born in Transvaal, South Africa in 1931, studied theology in England, and in 1978 became the first black general secretary of the South African Council of Churches. Throughout his life, he has been an ardent activist for interracial equality in South Africa and other countries. For his work in this realm he was awarded the Nobel Peace Prize in 1984. 4	Desmond M. Tutu, "Foreword: Why Is It Important to Learn about the Holocaust and the Genocides of All Peoples?" in Israel W. Charny (ed. ), Encyclopedia of Genocide (Santa Barbara: ABC-CLIO, 1999), pp. lvii-lviii. 5	Simon Wiesenthal was born in the Ukraine in 1908 and died in Austria in 2005. During World War II, he repeatedly escaped the claws of the Nazis. In the final days of the war and in its aftermath, he began gathering information for the American Department of Defense on the atrocities committed by the Nazis. Beginning in the 1950s, Wiesenthal dedicated himself to hunting down Nazi criminals in the hope that justice would be done and the criminals would be punished. He published multiple books on the Holocaust and established a number of archives and museums in its commemoration. 6	Simon Wiesenthal, "Foreword: Why Is It Important to Learn about the Holocaust and the Genocides of All Peoples?" in Israel W. Charny (ed. ), Encyclopedia of Genocide (Santa Barbara: ABC-CLIO, 1999), p. lix. 7	Elie Wiesel, "Then and Now: The Experiences of a Teacher," Social Education 42 (1978), 266-271. 8	Primo Levi, The Drowned and the Saved (New York: Vintage International, 1989),p. 12. Primo Levi, a writer, poet and chemist who was born in Italy in 1919, was sent to Auschwitz in 1944 but survived the camp. After returning to Italy, he began writing books influenced by his experiences during the Holocaust. In 1987, he took his own life. © 2015 The Open University of Israel. All rights reserved.